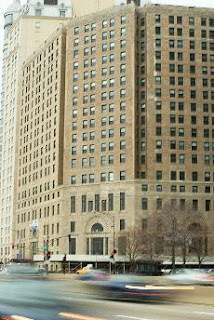 This is the Lakeshore Athletic Club, right across the street from our beloved 860 – 880 N. Lake Shore Drive by Mies van der Rohe. It was purchased recently by Fifield Companies who intend to demolish it. Read Lynn on what we might lose here. Here are snaps of how it relates to Mies. We all know Mies is best in context; and the Lakeshore Athletic Club is one of the few extant buildings from when Mies walked the site directly north of it, and designed 860 – 880. Ach! It’s so French vs. German. The building to replace Lakeshore would be by Lucien Lagrange. He gave us this, on the corner, spending a lot of money, as Fifield says they will. Dear Mayor Daley, Chicago Planning Commission, and the Landmarks Commission, why not “encourage” the developer save the exterior walls of the old Lakeshore Athletic Club? (And the wonderful ballroom, lobby and pool?) Unless he can put up something better for the citizens and the passersby. I’ll write more on this soon, stay tuned. You are currently browsing the archives for the Lucien Lagrange category.